Say Cheese - Event Announcement!!! 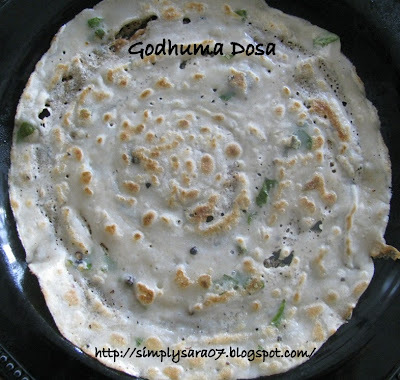 Godhuma Dosa(Wheat /Atta Dosa) is good for health. I make this when I am not able to prepare chapathi. This is very tasty and healthy for people on diet. Indusladies also has some recipes click here for more. Mix all the above ingredients in a bowl and leave it for 1 hour. Godhuma Dosai is ready. Serve hot with chutney/sugar n ghee. We refer to this as "Godhumba Dosa" in Palakkad. It was the standard Sunday morning breakfast in Palakkad and Bombay. This dosa looks nice and tempting. Along with the recipe, came a hundred memories. So, I'm asking amma to make this for breakfast on Sunday morning. Please try something in soups and salads. Healthy dosa, i just love this with spicy gravy..
ur version of wheat dosa sounds interesting and yummy...must try this soon!!! hey thats a very easy one. How much water do we pour for this..